This past week has been a total nightmare. It all started this past Monday morning when I, once again, stepped into a puddle of water in our living room. 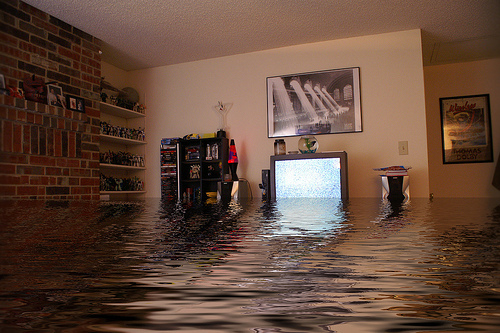 Our apartment has flooded several times over the past few years, so I was used to it. I put a call in to our landlord and they went to go pull up the carpets in the area that usually flooded. I opened the closet door and was in total shock. There was a stream of water pouring out of the wall like a faucet. I started sobbing. By the time my landlord got there I had almost fallen apart entirely. There was not much he could do. The water just came in like a flood going from our living room and spreading out to our bedrooms. Those are the rooms that were carpeted. The carpet was very old too. In the summer we had mold and mildew issues so the carpet always smelled disgusting anyway. So I knew having a flood like this would just make everything a million times worse. I called my husband to come home (he was at work) and we were trying to find a place to go that was local. Thank God for our Pastor who made arrangements for us to stay with people from our church who had an empty apartment. But I knew that would be difficult for me to be alone in an unknown place with 4 little children. My mom told us we could come stay with her in NJ (2 hours away). The kids would not be able to go to school, but I thought it would be best because at least I would have some help. We started to pack up our things. We sloshed through the water packing clothes in suitcases and gathering everything else that we would need. I couldn’t stop crying. I guess the fact that I was sleep depraved just from having a 1 month old in the house – made it soooo much worse. I felt like my whole world was falling apart. And then to top it all off, in the midst of our frantic packing – the power went out. So we then had to pack sloshing through a flood AND with no light. Crazy right? Thanks God our 2 older ones were in school and my 1 yr old was napping when I first so the flood. He slept for almost 3 hours that day as the chaos was happening right outside his door and as the water was making its way to his crib. When he woke up it got crazy because he did not understand why he could not walk on the floor. We tried to keep him in the pack & play, but after about 30 minutes he started freaking out. We then had to call a friend who came over to help with the kids while we finished the packing. We also had to move all the furniture out of the rooms into the kitchen (the one room that the water did not quite get to). That was nuts too because we wound up breaking one of our dressers and scratching the tile floor in the kitchen. We finally got out, picked up the kids from school, got McDonalds, and were on our way to NJ to my moms house. I was exhausted – more than exhausted. We have now been at my moms for almost a week waiting to figure out if / when we could go back to our apartment. We kept in touch with our landlord by phone. He was doing his best to sop up the water and used some heavy duty heaters to get the carpet dry. But I told him that he really needed to have the carpets ripped up and replaced. I just could not risk facing mold and mildew issues from the padding & concrete underneath not drying properly, especially with small children who practically LIVE on the floor. He kept assuring me that he would be replacing the carpets as soon as they figured out the leak and that it would only be a few months. But I said no that we wanted them ripped up or we really could not come back there with the kids. So, we have now been at my moms for a week. She is so awesome for taking us in. It has not been easy at all, but we are getting through. We found out from the landlord that he did wind up ripping out the carpets. But he also let me know that because of some big heaters that he had going in our apartment – all of my previous plants have died – there were probably around 15 of them. I think I might be the most upset about that. I am a HUGE plant lover. I have had many of my plants for several years. They were my babies. I have not yet gone back to the apartment to see them all dead, we are going to be doing that tomorrow. Hubby and I are going to go without the kids and assess the situation. I am hoping that the concrete will be dry so we can lay the area rugs and move the furniture back. We have been trying to find a new place to live, but there is not much available in our area within our price range. Right now we are stuck where we are and I am working hard at making the best of it. A scripture keeps coming into my head as my brain battles back and forth with negative thoughts. It has always been one of my favorites. Proverbs 3:5,6 “Trust in the Lord with all of your heart and lean not on your own understanding. In all your ways acknowledge Him and He will direct your paths.” I know God has a plan for us, no matter how bleak things are looking. I have had a lot of prayers and support through this and I am so grateful for that. My moms pastor also preached an awesome message yesterday on not basing your joy on your current circumstances. Storms of life will definitely come, but we can rely on the Lord to keep us calm in the midst of the raging waters. I love that! So many people are going through WAY more horrible things in comparison to our flood. Look at the people in Haiti who have lost everything. So, that has also helped. Putting things into perspective. Yes, I lost my plants – but I still have my children. Plants we can replace – people you cannot replace. Oh my. So sorry you are going through all that. Prayers for you and your family. Sorry to hear of all your troubles. But, this could be a blessing in disguise. If you had mold problems before God would know that and could have seen it in the carpet and this would be the only way the landlord would have ripped the carpet out to replace. I know what you mean about your plants. But, you never know they could come back. I had a few plants that died while moving across country and once got settle just kept watering them and talking to them (suppose to help them 🙂 ) and they came back. Thank God your baby was not on the carpet and face splat into the wet carpet. I’m so sorry to hear about your troubles my friend, but so happy that you are holding steadfast in your faith and leaning on God as your life preserver as you brave the stormy seas…this too shall pass. .-= Teresha@ Marlie and Me´s last blog ..Marlie and Me L-O-V-E Mom-preneurs #1: Sew Bebe (R&G) =-. OMG this just make me sick to my stomach seeing that picture! I am so sorry your apartment got flooded and about al lof your beautiful plants not making it too. Sounds like you a very wonderful mother and I am thankful everiyone is ok. Please keep us updated. I’m so sorry about this! I can’t imagine having to go through this only a month after giving birth! I’m happy your landlord ripped up the carpet though. It wouldn’t have been good for anyone in your family, especially the newborn to be breathing mold and mildew spores. I hope things work out for you and your family soon! .-= Chrystal @ Happy Mothering´s last blog ..This is a Lesson I’m Learning Very Quickly… =-. so I can understand what you went through. went out for you! Glory to God! I hope that all’s back to normal now, and the kids are once again enjoying life on the floor! Yes, I agree. God did protect us big time and for that I am totally grateful. We did wind up moving and the kids are enjoying the nice “dry” floor of our new place. We are truly blessed. Thanks so much for taking the time to comment. I appreciate your support. Oh my God. I’m so sorry to hear about your troubles. Everything will be alright. May God bless You & your family.